Remembrance Day has always been for Australians a quieter affair than Anzac Day, particularly as Anzac Day in recent years has taken on a brassy, bragging style. Most of us now do not even pause at 11am on 11 November. But perhaps there will be quietness during the day to think some thoughts about killing and dying. We may also unearth some clues about our life as a nation. The American jurist and Civil War veteran, Oliver Wendell Holmes, famously said, 'We have shared the incommunicable experience of war'. Holmes spoke for all veterans of his war and all other wars. Yet if the experience of war is 'incommunicable', we still talk and write an awful lot about it. If you type the single word 'war' into the Amazon search box, you get more than half a million entries. If something is 'incommunicable' then why so much communication? Holmes himself provided part of the answer: 'We have felt, we still feel, the passion of life to its top ... In our youths, our hearts were touched with fire.' Those who have gone through the fire, who have been passionate to this full measure, empathise with others who have done similar things and felt similar emotions. On the other hand, these men and women often find it difficult to pass on the experience to those who were not there. Wives, families and observers have frequently remarked upon the reluctance of veterans to talk of their wars. Most writing about war comes from people who did not serve in the conflict being written about. The American Civil War continues to attract a steady stream of volumes. World War I has generated thousands of books, with many more to come during the centenary. Then there is World War II, Korea, Vietnam, Iraq, Afghanistan, and numerous other smaller conflicts, all with their own literature. Why? Wars change history, often in unexpected ways. They are fascinating and exciting, with battles and sieges, the birth and death of nations, great and flawed leaders, masses of men under arms, heroism and cowardice, courage and cruelty, the broad sweep of grand strategy, military campaigns requiring analysis and explanation, individual human stories evoking sadness and regret. There is Lincoln and Antietam, Gallipoli and Edith Cavell, the Western Front and the Unknown Soldier, Anne Frank and Dresden, 600,000 Americans in Vietnam and Kim Phuc, Ben Roberts-Smith VC and Waziristan villagers taken out by American drones. The treatment of war often takes a didactic or even semi-religious aspect. Recently, Brendan Nelson, the director of the Australian War Memorial, has taken to recommending the 'Anzac' values depicted on the stained glass windows around the Tomb of the Unknown Australian Soldier — devotion, comradeship, coolness, endurance and so on — as a guide to virtuous living for young Australians. The historian Ken Inglis described Anzac as Australia's civil religion. Although we were the first country anywhere to come together under a national constitution after a mass popular vote, we downplay Federation and venerate instead a failed military campaign in Turkey in 1915. The interest in Anzac and in wars generally has intensified in Australia since around 1990. Does the sound and fury of war merit this sharp focus? Some observers have suggested we obsess about Anzac (and Pozieres and Fromelles) because we have had relatively few wars, compared with, say, Britain. Yet we have been involved in some kind of war for much of the last 75 years, in World War II, Korea, Malaya, Konfrontasi, Vietnam, Iraq, Afghanistan, and Iraq again. There is another possibility. Graeme Davison, in his 2009 Menzies Lecture, characterised modern young Australians trekking to the Dardanelles as like Ulysses in Greek legend. There was an element of Ulysses also in the journeys of the original Anzacs, many of whom had imbibed as children the myths of Greece and Rome, but today 'the old themes of patriotic duty and sacrifice have receded in favour of an emphasis on travel and risky adventure'. Davison argued that the Odyssey narrative has a strong appeal to a people who have always valued their worth in terms of how they are seen by great and powerful friends. Reliving the Anzac myth leads us into 'a chauvinistic attempt to prove ourselves in the eyes of others'. This strange Odyssey begins at home, though. The way we make much of Anzac suggests we still have a lot of maturing to do as a nation. At least the Remembrance Day minute was brief and dignified. Our recent obsession with making pilgrimages to battlefields, and with commemorating and sacralising and trying to understand the experience of war, has overshadowed other equally memorable and important but rather less showy parts of our history. It is said that, in our daily lives at home or at work, the urgent often drives out the important. In living our national lives, we are letting the noisy and exciting swamp what really matters. 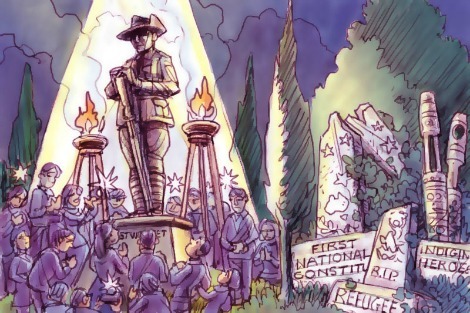 Until we make real progress in other fields — making multiculturalism work under pressure rather than simply as a slogan, for example, or reconciling meaningfully between black and white — Anzac will remain in place as a bloated and disproportionate national myth. David Stephens is the secretary of Honest History, a coalition of historians and others supporting the balanced and honest presentation and use of Australian history during the centenary of World War I. The views expressed in this article do not necessarily represent the views of all of Honest History's 300 plus supporters; it is a broad church. Memory is powerful. So is lived experience. Gallipoli happened at a time when our nation was young, when there was still a strong sense of unity to the 'mother' country and when there was an innocence about the effects of war. The extent of our loss touched so many families and we need to remember. It's not glorifying war but counting that experience as something extraordinary in the life of our nation. Having said that, Anzac Day (and to a much lesser extent Remembrance Day) have taken on an obsessive element and we need to be careful about keeping the truth of the Anzac and First World War story from becoming what that war certainly was not - exciting and mythical. Yes, war is horrible and I, as many others around me have forbears who died in war and its true that uncles and grandfathers did not, themselves talk about the war but that does not say we cannot respect the ideals they held going into war and the bravery they possessed. History always holds up leaders such as Alexander the Great, Napoleon, King Richard the Lionheart el al as icons but if we think about it they were just as much murderers as any they were fighting. Invading other countries is not a noble thing. I don't agree with David Stephen's assumptions that Anzac is a disproportionate national myth. It is just that more of the population honours the memories of its fallen warriors and those who could fortunately return. Your words about daily lives at home remind me that we have had "our own" war on this land, the protracted war of the (mainly British) incomers against the original inhabitants. Mary Gilmore tells of a man in the Hunter Valley who was forced out of the region by other whites because he refused to take part in the killing of the Wonnarua. The warning that he must conform or go came from the local clergyman! We don't like to think about this long war, one in which "we" the whites) were victorious. I wonder why we are so loathe to celebrate our "victory"? We must be the most warlike nation on God's earth - we never miss a stoush! Today at 11am I observed a minute silence and as long as I live I will observe a minute silence on Remembrance Day. Sorry David, but like many other "top down" critiques of why ordinary people remember things in extraordinary ways, your rather sad and hollow judgement gets in the road of the truth. That truth about remembering past wars and also about daily life is lived out by "bottom up" ordinary people who, if they didn't have the heroes of wars past - the many who gave their lives anonymously and without writing an essay as to why they went to war, they fear they may start a war, at home or elsewhere. Known unto God are the true motives of why people do good and remember the many who have done good before them. I wonder if in the decline of religion our national sense of meaning in life has been lost and in the search for this meaning we tend to hark back to our wars. Trying to make sense of the sacrificial actions involved in war . Perhaps its a search for a reason to live and a reason to die, that is inherent in Christian faith . The Anzac Day and Remembrance Day ceremonies honour those who sacrificed their lives, and their mental and physical health to help counter the greed for power by megalomaniacs - where would we be without this sacrifice. Thank you to those who served and those who still suffer the effects of war. Yes, the sound and fury of war does deserve the sharp focus of us all on these special days. It is usually those who have not served who try to downplay the commemorations - they will never be able to understand why there is a need for memories of mates who have gone to be rekindled on these special days. They need to get over they cynicism and join in giving thanks for the sacrifices made. Pat encourages us to 'get over [our] cynicism and join in giving thanks for the sacrifices made'. The problem with that approach is that we can forget that our war dead were actually sacrificed by our own 'megalomaniacs and their greed for power'. This is particularly the case for WW1. This is a brilliant piece, David Stephens. Thank you. I was born in Sydney during WW2, and was brought in the "Anzac Day means everything" tradition. At Uni I took Mod.Hist. & Pol.Science with a deep interest in both world wars. I learned a hell of a lot and my interest in war continues. These days Anzac Day mainly means the Kokoda and Milne Bay Battle for Australia & remembering my father, my very young uncles - their generation. Gallipoli focus is overdone and annoys me much. WW1 battled on the fields of Picardy and Flanders, where fifty odd thousand young Australians died, is where our foal remembrance should lie. Not Gallipoli. War, always started by men (I'm a woman, by the way) is appalling. Amistice / Remembrance Day 11 November, to my mind, is the real day of remembering. I always pause and quietly linger my mind on my grandparents generation - their dignity, their humility, their sacrifice - on the Western Front. Having cable TV, I always watch with awe and emotion the service at The Cenotaph, London Whitehall, led by the Queen. It is beautiful moment of gravitas, of respect, of focusing the mind. No grog on Remembrance Day, no partying, no showing off, no going home drunk, and bashing the wife, smashing up the place, as my father did. To me, that's what Anzac Day brings back. I did registered nursing training at a major Repatriation Hospital, for which I'll be forever grateful, for, ad a vet young person, that balanced my thinking and views regarding Australian participation in major wars - especially the Vietnam War. I also meant to emphasise that the most significant and most important engagement of Australians was for Australia, in the New Guinea Campaign of WW2 - Milne Bay & Kokoda - NOT Gallipoli! You seem to have misinterpreted my former comment, Mick McAndrew, it was not a judgment. I had two uncles died in WW! and my father died as a result of his service and I still fail to see the glory of war. There are many reasons why people die in wars and not all relate to self sacrifice, though some do . Perhaps it's not so much the personal but the national 'over the top ' celebration that is at odds with true meaningful remembrance. I recall someone once saying "Greater love has no man than this ,that a man lay down his life for his friends" I agree with all that".